Great food is amongst the most essential holiday delights: Boasting a distinctly epicurean philosophy, at Yria Boutique Hotel & Spa in Paros island, we take matters of the palate very seriously. 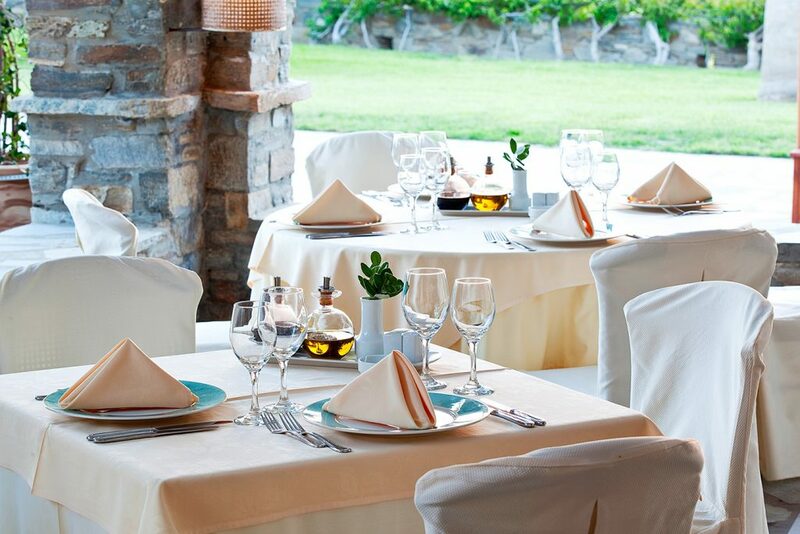 That is why our gastronomic offerings are one of the major fortes of our hotel; indeed renowned throughout Paros island; and a reason to visit Yria whether you’re a resident or not. But it’s not in our mentality to just rest on our laurels. In our quest to excel -and actually make a difference- this season we have inaugurated a collaboration with Paros island finest: Mario’s, serving a Greek-Mediterranean cuisine that seamlessly blends the finest locally sourced ingredients with contemporary cooking techniques, modern presentation and a touch of the unexpected; is no wonder the premier restaurant in Naoussa’s scenic fish port. This season through our novel-and exciting- culinary cooperation, Mario’s signature creations may be sampled -and savored- amidst the idyllic setting of Yria’s sea view Nefeli restaurant. What’s more, for utmost privacy -or for an unforgettable romantic experience- our dishes may be enjoyed at the comfort of your luxury Room, Maisonette, or Suite with room service; or even in your private villa rental. Yet, though markedly important, gastronomy is not the only good reason for which to select Yria Island Boutique Hotel & Spa in Paros island. Located at the heart of the beautiful Parasporos bay, amongst an oasis of vineyards, trees and wildlife, Yria, is inspired by the postcard-pretty archetypal island settlements. Blending Cycladic chic with the latest amenities and a vast array of tailor made services, it has justly become the hotel of choice amongst Paros island connoisseurs. To suit different party sizes and individual preferences, Yria offers a wide variety of lodging types: from the superior, romantic double rooms, elegant junior suites, two storey family maisonettes, luxurious executive suites, beautifully appointed suites with their own private infinity pool, to the spacious home away from home, residence suite, or the expansive, gorgeous Yria Ktima white stone, private pool Villa. Yet though addressing diverse demands and needs, all accomodation options are designed to offer the utmost in indulgent living. After all, this is what Yria boutique hotel & spa is all about: Making sure your every desire and whim is satisfied; while spoiling you rotten in the process! From total relaxation at the open air spa and the exotic pool; to the delightful concoctions of the Selini pool bar; or the culinary gems deriving from Mario’s and Nefeli’s restaurants association, Yria undertakes to elevate your holidays to unprecedented heights. We cordially invite you to come and get a taste of paradise on earth!